A fuchsia species originally found in South America, Peru, Argentina and surrounding areas. Not found widely in Australian gardens Fuchsia Boliviana is available for sale from specialist and rare plant nurseries. Best suited to a frost free position. Fuchsia boliviana is characterised by attractive tubular red flowers in late summer followed by small red fruits. This species Fuchsia is fast growing and will reach nearly 2m and grows well in semi shade in a humus rich moist but well drained soil. Fuchsia boliviana ‘Alba’ differs in that its flowers are white with a red tip. Both Fuchsia boliviana and Fuchsia boliviana ‘Alba’ can be pruned back heavily in autumn after flowering and will reshoot quickly. Also look for the desirable F. boliviano Luxurians. Flowering period for all varieties is from winter through to early summer depending on location. These are a naturally a tall growing plant to around 2m in height and they are not really very bushy in habit. So grow them at the rear of the garden border, where they can hang over smaller shrubs. Or prune regularly to get a better growth habit. 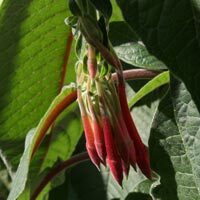 In a warm sheltered position and with humus rich fertile soil, this is a fuchsia that will flower for many months of the year. It will flower in light shade, however the flowers are better, and more profuse in a sunny position. A humus rich moist soil is best, however waterlogged soils are not suitable. Best when regularly pruned to maintain a more compact growth habit. The best time to prune is after flowering. We suggest regular tip pruning to maintain a more compact growth habit.